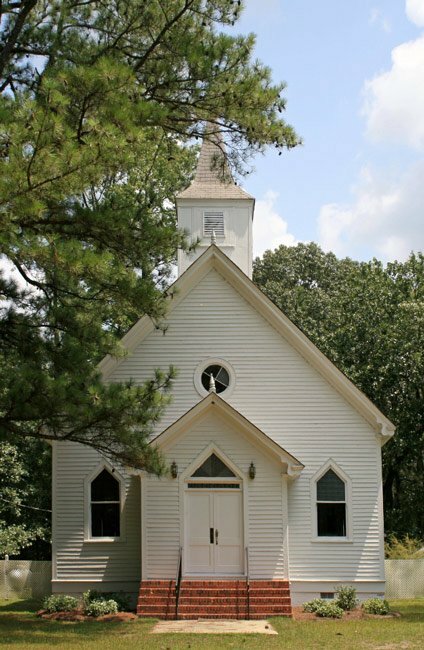 This Carpenter Gothic church has graced the countryside of Hartsville since 1911. Its congregation, however, is much older, having formed a half-century earlier, in 1856. For years, local Methodists attended services in neighboring Lydia and Darlington, but eventually they decided to organize a nearby church for themselves. Initially calling their church Jerusalem, the charter members built their first house of worship in August of 1856. By then, the congregation had changed its name to Bethel. The church was built by a Darlington County native, William H. Atkinson. Four years after the church was founded, the congregation added a building to its grounds for the Sons of Temperance, a civic organization that opposed alcohol consumption. The church again hired Atkinson for the building’s construction. A few years later, Atkinson was killed while serving the Confederacy during the Civil War. Bethel merged with another local Methodist congregation, Snow Hill, in 1885. The consolidated congregation built a larger church building along the present-day South Carolina Highway 151 Bypass and called itself New Bethel; in time, though, it became more commonly referred to as “Bethel.” Bethel began to see its membership decline as older members, particularly from the former Snow Hill congregation, died. Around the turn of the twentieth century, the members of Bethel made the decision to relocate to the church’s original site and build a new church. In 1911 Bethel replaced its first church building with the current one, which still houses the active congregation. The Sons of Temperance building that once stood near the original church is no longer extant. One of the aspects of historical research that continues to intrigue me is how much history we all see on a daily basis, and most people don’t have a clue as to what they are seeing. They drive by and say, “That’s an interesting looking building, I wonder how old it is?” and then they drive on. I don’t expect everyone to be obsessed with history, but more people should have a basic knowledge of past events and historic buildings in order to be able to appreciate what we have today. Our church this week is a good example of “an interesting looking building” that also has a rich history worthy of learning more about. Bethel United Methodist Church is located at 2413 Bethel Road, about a mile off of East BoBo Newsom Highway south of Hartsville. Many beachcombers drive close to it, and locals drive by it daily, but few realize that the church is 104 year old. It was organized earlier than that, in 1856, by several Methodists who had been making their way into Darlington or Lydia every Sunday for the weekly services. The primary “movers and shakers” in forming this church, which was first known as Jerusalem, were Thomas House, Jesse Parrott, Hardy Parrott and Samuel B. DeWitt. Before their building could be completed in August of 1856, the name was changed to Bethel. In 1860 a second building was built on the property for the use of the Sons of Temperance. Both of these buildings were built by a skilled carpenter from the Leavensworth area of the Darlington District. Mr. William H. Atkinson was employed to build these structures, and his payment was a place to live and one dollar a day for his efforts (we don’t have it too bad today, do we?). In an effort to find more work and revenue for his family, Mr. Atkinson entered the Confederate Army as a Substitute for Samuel B. DeWitt. Unfortunately, he was killed in action. The first officers of Bethel Church were Thomas House, Jessie Parrott, and Samuel B. DeWitt. The descendants of these men have represented the majority of the Bethel membership from 1856 to the present day. As was the custom with all Methodist churches of this period, each church would send “quarterage” to the Circuit Treasurer for the support of the ministry. It is recorded that during the dark days of the War between the States, on April 9, 1864, Bethel sent “200 pounds of pork and $125 in cash.” On July 15, 1864, the congregation sent “10 pounds of bacon and $10 in cash.” As true believers, the members of Bethel gave what they could and gave from the heart. Methodism, as well as many denominations, struggled to survive in the 1880s. The older, but more sparsely attended, Snow Hill Methodist – which was located just a few miles away – chose to merge with Bethel during this period. With this merger in early 1885, Snow Hill disbanded, Bethel deserted its original location, and a new meeting house was built near Flynn’s Cross Road on what is now Highway 151 bypass. Some members thought that a new church called for a new name. Pentecost and Parrot’s Cross Roads Methodist were names that were tried, but neither was quite accepted. Still trying not to use Bethel as the new church’s name, the group accepted New Bethel. Since there were more Bethel members than Snow Hill members in the new church, it wasn’t long before the short version, Bethel, was agreeable to all. The joint congregation stayed here for about 15 years, and as the older, original Snow Hill members began to die off, the congregation elected to move back to Bethel’s original site and build a new church close to the graves of its ancestors. This building is the wonderful little 1911 Carpenter Gothic building that we see in use today. The term “Carpenter Gothic” means that the building is Gothic in architectural style with its steeply pitched roof and pointed windows and called “Carpenter” because it is built of wood. 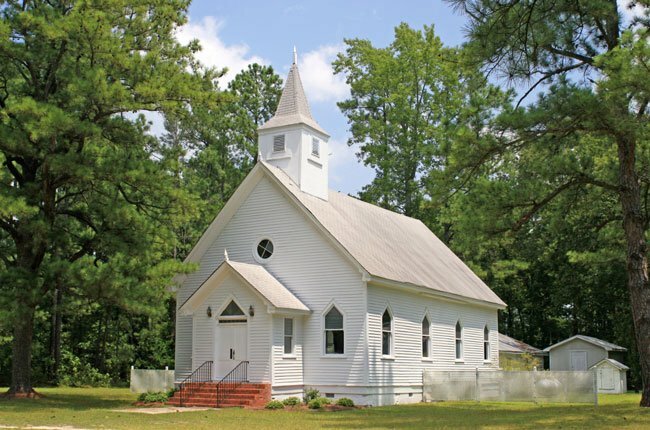 Many small community churches in this time frame were built completely of wood because wood was the most available building material to the members and many of the members had the skills to work with wood. So local trees were cut, a local saw mill sawed the trees into lumber, the members built the structure, and they then had a church – a church that they were proud of because they had built it with their own hands. Another typical characteristic of a country church is clear window glass. Not being able to make glass, it had to be bought, and obviously, clear glass was much more affordable than colored glass or certainly stained glass. If you’ll take a few minutes to stop by Bethel’s 30′ 6″ X 48′ 6″ building next time you are in the area, there are a few other easy-to-see details that you may find interesting. The building was originally built on brick piers, and later cement blocks were used to fill in the space between the brick piers. This can be seen at ground level. The windows are “single hung,” meaning the bottom sash is the only portion of the window that can be raised. The top sash has two small “window stays” under the sash that can be seen from the outside. With its vaulted ceiling interior, it appears that at some point in time, steel rods have been added to hold the exterior walls in a plumb position. These with their nuts and washers can be seen at the rafter plate level on the exterior walls. These are sometimes called earthquake rods. Now that you know more about this little building, when the weather cools down – and it will get cooler – do stop by and spend a few minutes with this little jewel. Regardless of how busy you think you are, you’ve got time to do this; you’ll feel better when you drive away. Marc, I am also descended from David Gregg and Harriet. What is your email? Saw your post on the Bethel UMC article and read you have the journals from the Snowhill Church. I’ve taken photos for Find-a-Grave when requested at the Snowhill Cemetery, but it’s in really bad shape. I’m interested in who is buried there, my spouse has Beasley descendants who are supposedly buried there. Would you be able to shed any history of this old church and cemetery? I actually had another person requesting pictures today. I live in Oklahoma. I drove into the Darlington area primarily to find the Wesley Chapel where my g-g-g grandparents Henry and Catherine Wood are buried. You might know that Henry was for a time a record keeper for the Snow Hill Society. I have his original journal book where he kept the names of the members in the 1830s. On the way to find the Wesley I saw the marker for Parrott in your cemetery. I am descended from David Gregg Wood and Harriet Elizabeth Parrott. She was descended from Benjamin Parrott. I would like to get in contact with members of the Parrott family to share the family tree information. Please email or call at (405) 833-1625. Thanks.